Others argue that consumer sovereignty is a myth. Firms produce goods and use marketing techniques to sell consumers good they don’t really need or want. In practice, there is an element of both. Firms may market new goods successfully like an iPod. But, if consumers are not impressed the good will not sell. There are countless new products, which never catch off. 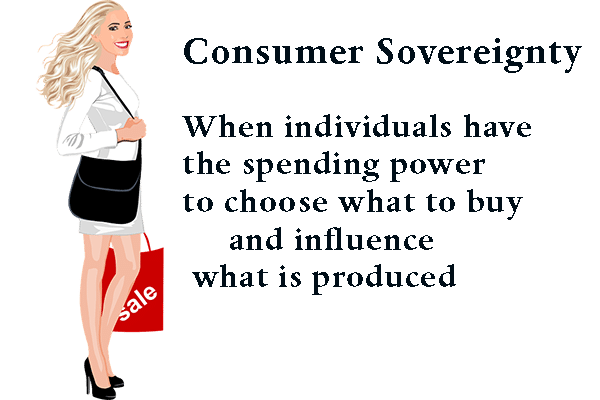 In a free market, consumers have greater levels of consumer sovereignty. In command economies, goods are produced according to state dictates so there is no consumer sovereignty. In some markets, it is much harder to cater to consumer sovereignty because of lack of knowledge. Doctors rarely offer patients meaningful choices. But, prescribe drugs and treatment based on their knowledge. Also, patients don’t get to choose between different doctors or hospitals but go to the one prescribed by private insurance or the state provided health care. You can, in theory, have a degree of choice, but in practice, it is a very different market – to save choosing a meal. Traditional economic theory assumes consumers seek to maximise utility. The equimarginal principle suggests consumers weigh up the marginal benefit of different goods, and choose a combination of goods which maximises total utility. Choice architecture. Strategic placement of goods by firms can influence our decisions, e.g. we are much more likely to choose the default option, then make an effort to change. Firms can use this to sign us up for newsletters or insurance. Loss aversion. We dislike losing what we already have and we go to great lengths to avoid losses. Nudges – subtle nudges can encourage us to buy what is suggested – ‘Would you like fries with that?” – definitely encourages more people to buy extras.